Honolulu, Hawaii — Vincent H.S. Lee, HHSC Oahu region chief executive officer, has been selected in the Modern Healthcare Top 25 Minority Executives in Healthcare list. 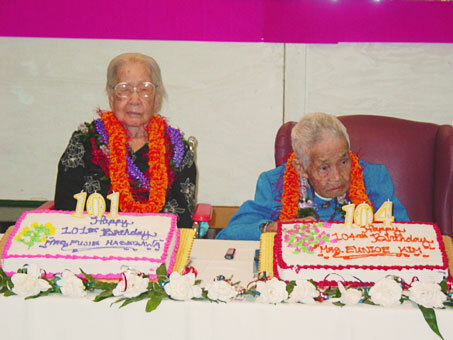 Honolulu, Hawaii — Leahi Hospital, as part of its National Nursing Home Week activities, May 8-12, recognized its oldest residents (long-term care patients). The nursing home staff honored Mrs. Eunice Kim, who turned 104 years old on April 23, and Fujie Hasegawa, who will turn 101 years old on May 22. Honolulu, Hawaii — Leahi Hospital has expanded its Adult Day Health program in Kaimuki to better meet the needs of today’s independent seniors. The Leahi Adult Day Health Center held a dedication ceremony and open house 2:00 p.m., Friday, July 18, 2003. The dedication was intended to explain about the comprehensive services offered by the Leahi ADHC, in addition to offering an opportunity to meet its clients, staff, and volunteers. Honolulu, Hawaii — Leahi Hospital kicked off Nursing Home Week today by celebrating a special wedding anniversary for its oldest resident with a living spouse. Florentina Marquez, 95, and her husband, Benny, 99, celebrated 60 years of marriage with a cake decorated with their 1943 wedding photo. The couple shared their special day with close to a dozen hospital residents and staff members.